I made this project bag for a swap on Ravelry. 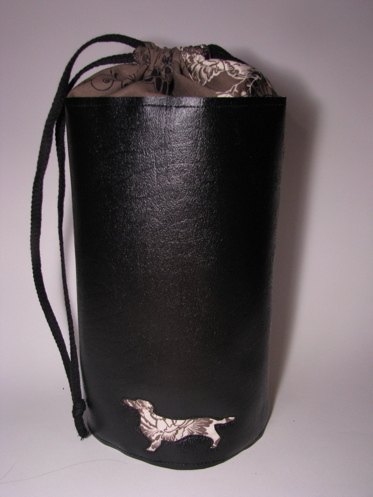 I chose the black vinyl for the main fabric on the outside because I thought it would be easier to keep clean and it would give instant rigidity to the bag without the need for additional support. 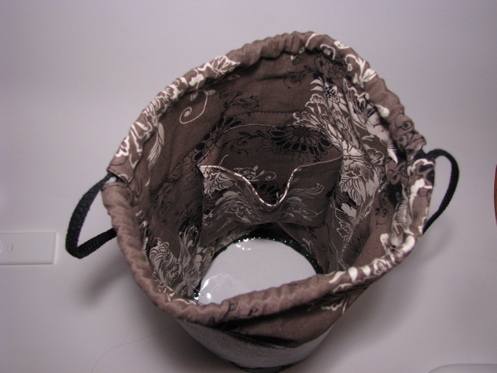 The cotton print lining peeks up about 4 inches to make the drawstring top. There is also a little inner pocket made out of the same print and if I make another one of these bags I will use a contrasting fabric to make it easier to see. The main feature I wanted to try out was making the bottom of the bag out of clear vinyl. I personally tend to forget what is in a container if I can’t see through it. Any kind of container. So I thought a little window on the bottom would make it easy to check what was inside if you put your project aside for a while or if you have too many project bags! While the rest of the bag went together fairly easily, I did not figure out a good way to work with the clear vinyl. But I will try again! The recipient likes dachshunds so I did a little reverse appliqué dachshund on the outside of the bag in the same print. It was not hard to do. Since the vinyl does not ravel when cut, there was no need to turn the edges under. I just put a scrap of the cotton print behind the opening which I cut with a craft knife, and then stitched around the edge of the cut-out on the sewing machine. Fun and easy personalization. Cuuute Dashsund and really fun idea!